Taking advantage of the growing number of consumers using their mobile devices, the companies have started advertising their products and services to their customers. Sending SMS to their clients and suppliers will allow them to communicate faster and stay in touch with them. By using SMS Notifier module in vTiger SMS Online CRM plugin you can get in touch with your clients faster by sending personalised SMS Messages to customers. Consequently, you can increase your sales and strengthen the relationship with your customers. 4. Go to path "/modules/SMSNotifier/providers"
5. Move ISMS.php and transfer to path "/modules/SMSNotifier/providers"
To send SMS you need SMS service provider details; This can be filled by administrator from Settings page. Few simple steps to configure SMS Server in vTiger SMS Online CRM Plugin. 1: Go to Settings Icon (top right corner) > CRM Settings > Module Manager. This can be found under 'Settings Shortcuts' section. 3: Click on the link Server Configuration. 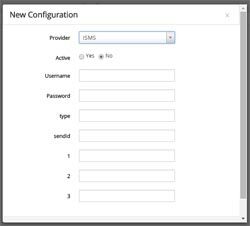 You can configure SMS Server information by clicking on Server Configuration. 4: Click on 'New Configuration' button and provide SMS provider information. 6: Type in your SMS Message and click 'Send' once you're done. 3: To send SMS in bulk, go to the list view of Leads, Contacts, or Organizations, Select the desired number of records by ticking the tick boxes on the left.